When it comes to selecting the right Holter Monitoring solution for a medical facility, there are two common structures available. 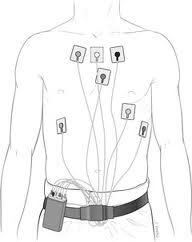 For maximum reimbursement, it is recommended to purchase the Holter Monitoring technology & perform your own (technical) analysis of the ECG information. The second option is to outsource the 24 hour analysis to one of the Holter Monitoring Service Companies. The purpose of our analysis allow you to compare both service & purchase structures as well as the features & strengths of the companies across the industry. Hemodynamics Company is the newest company to enter the Holter monitoring space with their wearable ECG monitor called the EZecg Patch. Hemodynamics offers a refreshing solution with a service model aimed at improving the complaints of existing patch companies for poor ECG quality, unacceptable turn-around time & lack of relevant data in the final report. Applied Cardiac Systems (ACS) is a U.S leader in Holter Monitoring. ACS has been a consistent player in providing Holter Monitoring solutions geared towards the Cardiology market segment. Although CardioNet is most known for pioneering Mobile Cardiac Outpatient Telemetry (MCOT). CardioNet has significantly expanded its presence in both the service side as well as the equipment side of Holter Monitoring with the acquisitions of Braemar, Cardiocore, and Biomedical Systems Service division. GE is known as an industry giant in the medical industry. Much like other GE products, the Holter Monitoring equipment is built for reliability. GE acquired Marquette in 1998 to enter the Holter Monitoring space. iRythm Technologies is becoming a familiar name in the ambulatory cardiac monitoring with their wearable Zio™ Patch. iRhythm is not a traditional Holter monitoring company as their device records for extended periods ranging from 3 days to 14 days. Lifewatch is a prominent ambulatory cardiac monitoring company now operating under the umbrella of BioTelemetry. It is rumored that BioTelemetry / LifeWatch has discontinued their traditional line of Holter Monitoring products & service now replaced with the BioTelemetry long term continuous monitor called the CardioKey. Medicomp is an ambulatory cardiac monitoring company that has been in business for 3 decades. Medicomp is known for manufacturing their own devices including Holter Monitoring products. MidMark is a diversified medical company with product offering ranging from examination tables to Holter Monitoring products. MidMark as made their ‘mark’ in Holter Monitoring by providing an seamless EMR interface that other Holter companies have struggled to implement. Mortara Instruments is a Holter Monitoring company that takes great pride in the research sector of the ambulatory cardiac monitoring industry. Mortara has several reseller / service companies that use their Holter devices. Phillips is another industry giant that entered the Holter Monitoring space with the acquisition of Zymed. Phillips a serious player in Holter Monitoring industry catering more to the hospital segment than to private practice. Scottcare is a cardiac rehab telemetry company that entered the Holter Monitoring segment with the acquisition of Rozzin in New York. Scottcare has shifted focus as a company to ambulatory monitoring with the Rozzin Holter brand. Spacelabs is a company that many are familiar with in the Holter Monitoring industry. Spacelabs has evolved in the Holter Monitoring industry over the years with the acquisition of DelMar / Reynolds Holter technology. Welch Allyn is another well diversified medical products company with a Holter Monitoring product. Welch Allyn is primarily ordered out of a catalog rather than any direct penetration for their Holter Monitoring products. Please complete the form below to Download your Free Holter Monitor Comparison.